Who are the "re-born Knights Templar" that the Christchurch Attacker references? "No group ordered my attack, I make (sic) the decision myself. Though I did contact the reborn Knights Templar for a blessing in support of the attack, which was given." This struck me as interesting. Not because it's a reference to Anders Breivik's Pamphlet "2083 - A European Declaration of Independence". Tarrant makes no secret of the fact that the Norwegian terrorist influenced him. But because of how precisely it ties in with what Breivik claims about the "Knights Templar". Let's take a look at what Breivik claimed in 2011. (...) "the Knights Templar was re-founded in London in 2002 by representatives from eight European countries (...) as a nationalist military order (...). The Order is to serve as as an armed Indigenous Rights Organization and as a Crusader movement (anti-Jihad movement)". In 2012, I tried to follow up on the leads that Breivik left in his pamphlet regarding this alleged meeting in London. For example, he mentioned a British "crusader" with the nom de guerre "Richard Lionheart", his "assigned mentor" at the meeting. Breivik also wrote that he wondered whether one of the founders of the English Defence League might have been among the conspirators who re-founded the Knights Templar. To cut a long story short, I never managed to find proof that the secret meeting in London actually took place (even though Breivik was in London in 2002 at least once). So it seems sensible to assume that Breivik simply made the meeting up. It serves the convenient purpose of suggesting that there exists, in total secrecy, a powerful organization that like-minded people can join up with fairly simply, after all. Now back to Terrant. He revers Breivik. He is inspired by him. He also likes to think of himself as a crusader. And what does he do in his pamphlet? He in turn claims to have sought - and received - the blessing of the very fantasy organization that Breivik invented! In short: because Breivik and Tarrant, in a way, managed to make an illusion become real. Let me put it this way: If two terrorists who between them murder over 120 innocent victims agree they both acted in the name of or as representatives of the very same organization, the re-founded Knights Templar - does it really matter if it is a "real" organization in the "real" world? Or wouldn't we actually have to concede that it in a very disturbing way it just became real? All of this reminds me of something. I remember very well when "Islamic State" (IS) started asking sympathizers the world over to start acting in their name. IS would then accept the perpetrators as their own by adopting them after the fact into the organization that these men in some cases never had a "real" connection to before. When IS first launched this new strategy, it was quite new. We are now used to it, but back in the day it led to heated arguments about what constitutes a "real" IS attack. So here is my point for today: In order to better understand the possible dynamics within the extreme right/neo-crusader movement, I believe we should allow for the notion that for these people the Knights Templar may be more than a fantasy. March 5th, 2019 - The German Ministries of Interior and Justice have come to a basic understanding about how they want to try and strip German jihadists of their citizenship. Because this is by no means a trivial matter, I thought it might be useful to describe their plan in a some detail. The current grand coalition government has already agreed in principle to tackle this issue in their co-operation agreement upon forming a government. But until now they didn't get around to passing the respective law (or more precisely: to amend the citizenship law). One reason for the delay is that, according to the Ministry of Justice (led by the Social Democrats) the Ministry of Interior (led by the Conservatives) demanded changes that went beyond what had been agreed upon in the coalition's co-operation agreement. In the light of the problem surrounding the German IS population now being held in Syria in SDF camps, the issue became more pressing, resulting in declarations from both ministers that they found enough common ground to start the process. c) person in question must have participated in battle on behalf of a "terror militia". In addition to this it is clear that the law will only apply to future cases. So the current inmates in Syria and Iraq won't be affected no matter what. Beyond the fact that an agreement has been declared, nothing definite has been put into writing. What does exist, however, is a draft for an amendment of the respective law, authored by the Ministry of the Interior. That ministry clearly expects their document to be the document of reference in the process. But it is not entirely clear that the Ministry of Justice concurs. Technically, this draft is currently in the process of reconciliation between the two ministries. a) What is a "terror militia"? b) What if "the other state" also revokes citizenship? What happens if Germany strips a dual German-Egyptian citizen of his German nationality, and then Egypt does the same thing - have we then not rendered him stateless at least in an indirect manner? Until now, I have not heard a good answer to this possible dilemma. c) What if "the other state" is not a state of law? Let's say "the other state" does not revoke the citizenship but is very keen to receive our fictional formerly German foreign fighter - because that state wants to torture him or lock him away forever or sentence him to death? Does there not exist some degree of responsibility on the part of Germany to prevent such treatment? Right now, the Ministry of Interior insists that if they have it their way, this problem would not be a factor at all: German citizenship would be revoked without assessing individual repercussions. d) Will there be legal recourse? And who calls the shots anyway? The Ministry of Interior says they imagine some way of legal recourse against the decision would be available. But I assume that would be theoretical mostly - since the law is aimed at people living abroad who won't be able to return to Germany after the revocation of citizenship. So it's safe to say that it's going to be very complicated to take legal action against this decision. A decision that will be taken by ... who exactly? According to the draft amendment the decision would be up to the administrative bodies of each the 16 German states. But here is a problem I see: It is already hard for German courts of law to prove that foreign fighters participated in a battle. How will these bodies be able to determine this with much less expertise and access to specialized resources at their hands? Will a picture on Facebook with a gun in your hand be enough? Or the statement of somebody who claims to have fought alongside of you? All these are open questions right now. 4.- What will happen next? A lot depends on the Ministry of Justice now, as the ball in their court: they are expected to send comments on the draft back to the Ministry of Interior. So they have to make up their minds about how much debate and conflict they want to invite or risk - especially given that there is public pressure to get this amendment passed. I don't want to make predictions here, but I would not be surprised if the Ministry of Justice will declare they do have a few issues with the current draft. In fact I hope so. I think the draft can be and ought to be improved. March 1st, 2019 - I recently had a chance to study a secret three page memo produced by German domestic intelligence agency BfV (Bundesamt für Verfassungsschutz) in January of 2017. The document contains notes from an analysis authored by their US intelligence counterparts on "the role of IS Libya in regard to the attack of December 19th 2016 in Berlin", which of course is the van attack on a Christmas market in the German capital by Tunisian citizen Anis Amri that killed twelve people. Together with my colleagues at DIE ZEIT, I have published extensively on Anis Amri, his background, his attack and it's preparation (see here and here, e.g., both articles in German). But the BfV memo does contain some new information that is actually quite interesting, especially as it sheds some light on the hitherto speculative nature of the relationship between IS in Libya and IS central in Syria. What we knew until now was that Anis Amri in his attempt to join up with IS resorted to contacting Tunisian extremists, some of which he very likely knew from back home. More than once Amri made it clear in his messages that he was willing to conduct a terror attack in Germany but felt he needed guidance. The Tunisian IS members he corresponded with, some of whom were fighting with IS Libya in Libya at the time, promised him they would put him in touch with an authorized handler. 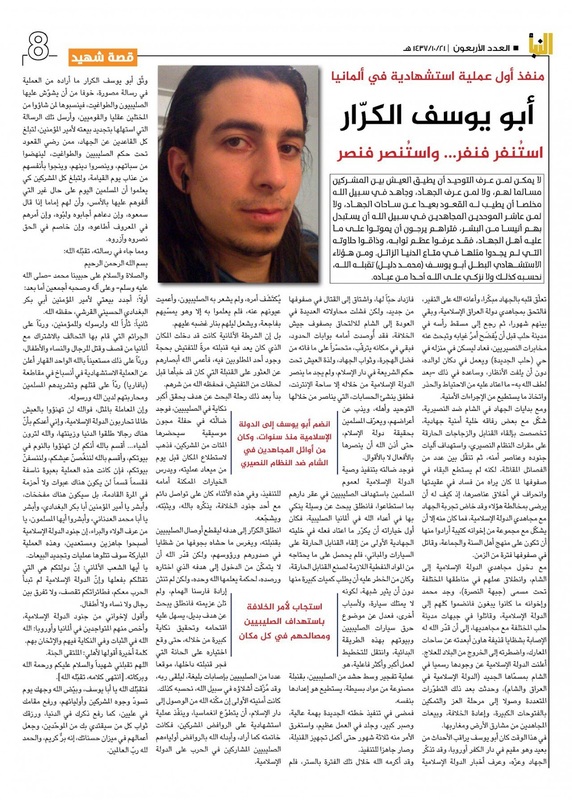 In the end, they managed to do just that: A mysterious man with the nickname "Moumou1" got in touch with Amri, supplied him with a pdf brochure addressing willing terrorists and chatted with him until and even during the day of the attack. Amri even sent "Moumou1" a picture from inside the van after he had taken control of it and killed the driver, only moments before he crashed it into the crowd at the Christmas market. "Moumou1" has since been identified somewhat confidently by German and Tunisian investigators as a Tunisian citizen who was and likely still is involved with IS Libya in Libya. So we know for a fact that Amri had a relation with IS Libya. But in fact, we also only know for sure that he had a relation with IS Libya. We do not know that he ever had a personal connection with IS central in Syria, even though IS central claimed responsibility for his attack a day after it happened and published a video taped by Amri prior to the attack in which he offered his Bai'a to IS leader Abu Bakr al-Baghdadi on December 23rd. We had, until very recently, no idea whatsoever how it came about that IS central got to claim the attack and publish the video. According to the document, US intel informed their German colleagues that a media representative of IS Libya named "Rashid" "informed core IS about the role of IS Libya in the attack and co-ordinated the public claim of responsibility by IS". This means that IS Libya got in touch with HQ in Syria right after the attack and offered to IS central that HQ take credit for it (rather than claim it for themselves). In addition to this, the memo states that according to US intel, IS central in Syria was expecting more attacks by IS Libya since "requirements for media post-production for future attacks were addressed" between the two IS structures. US intelligence, according to the Germans, believed that IS central in Syria interpreted the Berlin attack as proof that IS Libya way capable of their own external operations planning. A last piece of detail in the memo that deserves our attention is about a hitherto unknown second video by Anis Amri. I already mentioned the video that we all know and that was published by IS central on December 23rd 2016. But the memo states that according to US intelligence a second video was received by IS Libya on October 23rd, 2016. 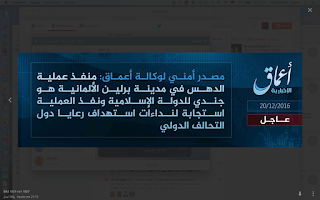 Unfortunately, US intel doesn't seem to know what's on that video, but clearly the assumption is that it might be similar in intent, meaning that Amri may have made up his mind about wanting to actually commit an attack by that date at the latest. Until know, German investigators assumed the earliest date they could establish for Amri having decided upon an attack was either October 31st or November 1st, 2016: the dates on which according to their technical investigation Amri's other video must have been taped. I for one am very curious if we will ever get to see that second video. Maybe it was not up to the standards that Amri's comrades expected, and in that case it will never be shown. But maybe they will publish it on the occasion of some anniversary of the attack - like AQ did with previously unknown video testimony of members of the 9/11 cell even years after the attack. They mystery of Amri's friend Bilel B. Be that as it may, but let me conclude by bringing you up to date on a few aspects of the Amri saga that have recently been debated in Germany and have led to some confusion in the media. One German magazine recently ran an article claiming that Amri's friend Bilel B., who was a suspected co-conspirator for almost a year and sent back to Tunisia in Februar 2017 in spite of that fact, was in fact an asset of Moroccan intelligence. It went on to suggest that Bilel B. was spirited away to Tunisia in order to cover this all up. No proof was offered to back up this proposition. So what to make of it? I will put it this way: I have read around a hundred thousand pages of documents relating to the investigation and no-where was there any indication that this might be the case. Also, German officials said on and off the record they have no information to that effect. Another allegation was that a video existed that allegedly shows Bilel B. as a knocks down a bystander with a wooden two-by-four in the immediate aftermath of Amri's attack in order to open up the way for Amri to flee. And that this tape was also being hidden. While a bystander was in fact hurt (and is still in a coma), German officials have stated very clearly that no footage exists that would place Bilel B. at the scene at that time. I concur with that in that I am also not aware of any such footage. This is not to say Bilel B. didn't know anything about the attack. He very well may have: He met Amri on the evening before for dinner. He is a hardened Jihadist. He took pictures of the exact place that Amri drove through with his van - but months earlier. Anyway, thanks for stopping by and bye-bye! PS: Here is the link to my story about the BfV Memo for ZEIT ONLINE (German). Edit: Due to a spelling mistake, it said that there was "now" proof that Bilel B. was a co-conspirator, but it should have said "no" and was corrected. October 18th, 2016 - In recent weeks I have had the chance to speak to several knowledgable and interesting people. I can't identify most of them by name and therefore won't identify any of them just to be on the safe side. 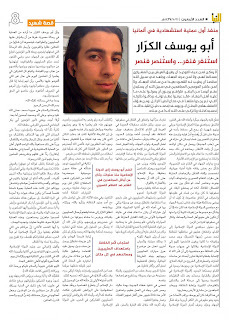 Suffice it to say that one of them says of himself that he is an ISIS member (full bai'a and all); that two more consider themselves supporters of ISIS and know a number of people who formally joined and/or are currently in Syria or Iraq; that another two are former Baath era military officers and that three of them are members of Syrian rebel groups. Of course this is a group of truly varied backgrounds. The interesting thing, however, is that they largely agreed on how ISIS has prepared for the battle of Mosul and what might be happening next. * ISIS will not waste a significant number of fighters in the defense of Mosul. The lowest estimate was as low as 300. * ISIS will try and make the unavoidable fall of Mosul as expensive as possible for the attackers: They will encounter massive amounts of booby traps; perhaps snipers. * ISIS will try and exfiltrate into a) those desert areas of Iraq that are close to communities where there is a certain degree of tacit or open support for them and b) those areas of Syria and Iraq still under their control including some that have probably been prepared for that purpose in advance like al-Qaim but also the lesser known area of Bir Qassab in Syria. * ISIS will not be destroyed by the loss of Mosul at all but is quite capable of surviving and perhaps even making a come-back after a while, especially when Mosul and the liberated areas can't be pacified properly. * Foreign fighters of ISIS will have a hard time leaving the theatre of war: Most of their passports would have been burnt a long time ago, most of their governments know them and would immediately arrest them. This means they will either die fighting or try and lay low with the local contingent. * ISIS will soon return to guerrilla tactics, especially in Iraq, attacking "everyone not IS" with all means possible, ranging from sniping attacks to IEDs and skirmishes. Some of this may not be super exciting stuff and you may have come across it elsewhere. But I found it interesting that a group that diverse would agree on so many things. * The man's name is given as Abu Jusuf al-Karrar, which sounds like a Kunya to me. * During this period allegedly German police raided the "Makan", which I would read as the place where he lived, so rather the facility than his particular room. In any case, they didn't detect his plans. * He is also said to have been in constant touch with "one of the soldiers" of the IS. If the basic facts check out, this would point to the attacker not having been a refugee who radicalized after coming to Europe but to having been a dyed-in-the-wool jihadist who hid is intentions and beliefs. If the basic story checks out, it would also mean that the Ansbach attacker would have to be placed somewhere between what we already have learnt are different prototypes of IS-inspired or -directed attackers in the West: He would not have been sent here with orders to disguise himself as a refugee in order to perpetrate an attack like some of the Paris plotters and attackers. But he would also be different from, e.g. the Wuerzburg attacker, who for all we know radicalized here. Some of the claims, I am confident, the security services will be able to check out and then we will know more. It is likely that the IS exaggerates some aspects. It is in my opinion also unlikely, however, that the IS completely fabricates a story like this. April 7th, 2016 - I have recently had a chance to take a good look at just over 3000 foreign fighter entry documents of the "Islamic State" (IS), a collection that I believe to be partly or even largely identical to the ones that Zaman al-Wasl, SkyNews and several German media have reported about a few weeks ago. I have published an analysis of these documents in today's new issue of DIE ZEIT, the paper I work for. The article can be found online here, but is entirely in German. For the sake of non-German speakers, I have decided to share my main findings in English here. I have used two approaches in analyzing the documents. One is a systematic, number-based approach, one is an anecdotal approach. I believe both to be revealing in their own way. The forms are standardized and they ask for answers to 23 questions. 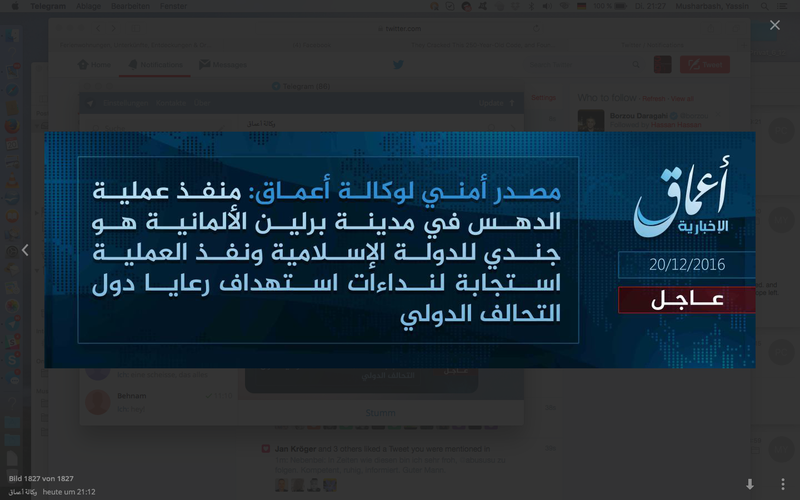 The IS wants to know about the real name and the kunya of the recruit, they ask for the name of the mother, nationality, date of birth, the blood typ, the point of border crossing, an address, prior Jihad experience and specializations, among other things. Two questions are multiple choice: Does the recruit want to become a) a fighter, b) a suicide bomber or c) an Inghimasi. And the recruit is asked to classify his level of Sharia literacy: a) weak or b) medium or c) student/scholar level. Recruits are also asked for an address or phone number to contact in the case of their deaths. And lastly, there is a column called "comments", which IS cadres have in some cases used to add interesting additional information. The IS cadres who filled in the forms where not all equally diligent. In many cases, the forms are not fully complete. Also the ways in which answers have been taken down are not 100 per cent coherent. So it can happen that someone who has the kunya "Abu XYZ al-Almani" may not have listed an address in Germany or a German nationality, but a phone number in Tunisia. Is he to be considered a German? And if not: What then? It is therefor only possible to reach conclusions that cannot be considered hard statistical science. I have nonetheless tried to work the numbers as much as I could. Just under ten per cent offer to die as suicide bombers ("Istishhadi"). Even less want to be an Ighimasi. The vast majority opts to become a "fighter" ("muqatil"). Roughly three quarters think of their own knowledge of Sharia as "weak". The large majority of recruits is aged between 20 and 30 and appears to have had no real jobs or jobs that require little training or have had no advanced schooling. The biggest contingents reflected in the documents are from Tunisia and Saudi Arabia, followed by Libya, Morocca and Egypt. The "comments" that IS cadres added are very revealing even if they are very diverse. Each entry consists of a few words only but sometimes feel like a short story, giving us an idea of the personalities attracted to the IS. "Used to be with al-Qaeda in Afghanistan for 5 years"
"Can see very well, even in the night, ma shah Allah!" "Important ** has chemical experience"
"Has switched to 'suicide bomber'"
"Please tell my father and my mother to forgive me"
3.000 out of what are possibly 30.000 IS fighters is a pretty good sample but there may be serious distortions we don't know of and we can't say if our sample is fully representative. Certainly the sample contains little in the way of sensations, even though known terrorists are among those whose entry forms are available like Mohamed Belkaid, recently killed in a Brussels raid. Much rather, the sample solidifies some of our assumptions. Further research into these docs is needed, for example in order to find out who travelled to the IS with who, something that is especially interesting in regard to European foreign fighters and the terrorist network they have established between France and Belgium. The anecdotal observations give un an idea of the spectrum we can find within the IS: veterans of Jihad next to beginners, professionals next to scared people, educated and skilled people next to untrained and probably not very intelligent recruits. Not all of these will turn out to be master warriors, master terrorists or even master administration officials. Al Qaeda bureaucratised the jihad long before Isis, which benefited from inheriting many of its forms and processes when the two split. Poorly organised terrorist groups have short life spans. Al Qaeda turns 30 next year. The mixing of bureaucratised jihadis with former regime elements makes for an even more paperwork driven organisation. The files show that the foreigners come from a wide range of backgrounds and bring different skill sets, but they expect the same outcome: death. They also show that IS is combing the recruit population for special skills or connections for use in operations. I fully agree with both of them. November 29th, 2015 - I acknowledge that the Paris attacks have changed the debate. I understand why France chose to retaliate with air strikes on Raqqa, one of the in fact two capitals of the "Caliphate" the "Islamic State" (IS) pronounced last year. I even get why the German government has decided to support France and all the other countries bombing the IS with reconnaissance capabilities. However, there still are two elephants in the room when we are discussing fighting the IS, and they ought to be addressed. 1.- If the IS were to be driven out of all Syrian territory tomorrow, with - for argument's sake - the help of Putin, Assad, the US, all Arabs: Would the IS be defeated? - Clearly not. 2.- If Assad stays in power or not, how much of a difference does it make in terms of the chances of the IS to survive? - Clearly: very little. What does that mean? It means this: The political future of Syria and the demise of the IS are in fact two mostly separate issues. I know this is counter-intuitive. But looking at it in this way makes the choices in front of us much easier. We do not need Assad to finish the IS. Period. Which leads me to the second elephant in the room: The fact that the ongoing discussion of whether there should/might/can be a role for Assad or one of his relatives or proxies in the future as a leader of an interim Syrian government that would in one way or another include opposition forces and at a later point in time hand over power to that opposition seems to be based on the idea that Syria still somehow is a state and will be a single united state in the future. 1.- Assad is not going to get all of Syria back. 2.- The opposition is not going to be able to get all of Syria under it's control. This is not purely a matter of military might. It also has to do with legitimacy. Assad has killed hundreds of thousands, but there are millions who support him inside Syria and wish for him to stay in power. It is a fact. These people are spread over a largely coherent mass of land in the country. Most of the rest of the country (not counting IS territory) is strongly against Assad and will not accept a future tole for him or one of his proxies. He has a lot of actual legitimacy in one part of Syria and almost zero legitimacy in the rest of the country. It all boils down to this: What is better, a real ceasefire with a de facto partition? Or an agreement pertaining to the whole of Syria, but one that is going to be so feeble that the likelihood it will just jumpstart another round in this terrible war is rather big? I know, I know, I haven't even discussed the Kurdish issue. And I haven't offered any ideas on Iraq. But hey, there are just a few thoughts.